i usually use insoles on my boots, but my SJs fit snugly that i dint need them. you're just prolly not used to it yet. when sized right, the "Arch Ease" actually works_ unless you got low arches. also, i just recently observed on my Baker's MTO SDs, that the Arch Ease does not function well if you fcuk around with the heels. it somehow messes up the foot bed or the last itself or both. i had mine lowered by 1/4 on block heels w/ Vibram half-soles. anyone with white's use an insole for comfort? after standing on concrete all day, my feet definitely feel it. even with the vibram composition sole and an anti-fatigue mat it's still pretty savage. not that i could fit much of an insole in my boots anyway, the fit doesn't really allow for one. how old are your boots? mine usually feels like that when new around 5 months of wear? when they reach around more than that and after your first resole. thats when youll love your boots really yours bounty hunter / semi dress? or smoke jumper last? Well, I guess I've found the limits of a pair of Alden shoes. 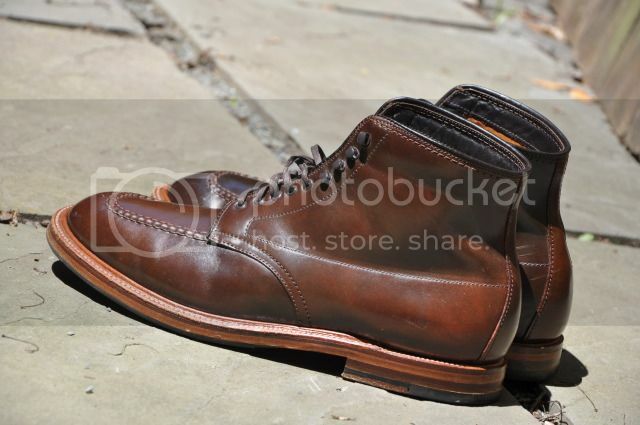 My favorite pair of Plaza-lasted cigar shell captoe shoes were in desperate need of refurbishment. I sent them back to Alden and sadly, today I received the bad news that when they attempted to refurbish them, they fell apart due to the condition they were in. I started wearing them around August of 2007 and had them refurbished once before. I'm guessing I wore these shoes an average of every 2-3 days for almost the last 5 years. The recently developed a crack in the leather right along the cap, so I'm assuming that's where they blew apart when they tried to re-last them. Alden unfortunately was unable to provide me with an exact replacement as it was a custom makeup by Alden New York, but is doing me a solid by selling me a replacement #8 pair on the Aberdeen last that they have in stock at their wholesale price. I've got an exact replacement pair on order with Alden New York, but last I heard it could be a couple of years before the order gets fulfilled. Sale on at a fine pair of shoes , some good bargains to be had . 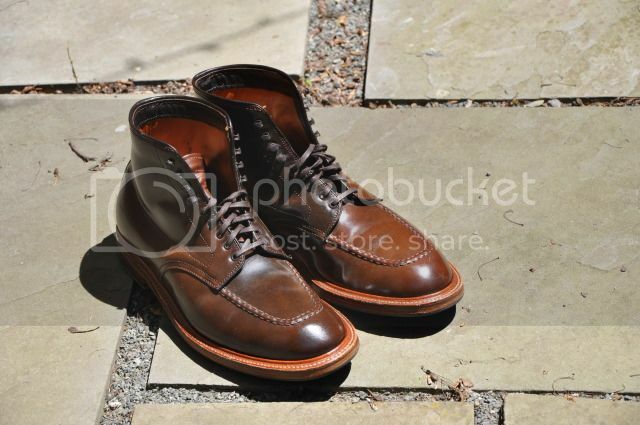 I purchased some Alfred Sargent Montrose from them a while back , excellent service . 5 years seems like an awfully short time for a pair of shoes to fall apart. I guess it depends on how you treat them and all but still, anyone else find that abnormal? 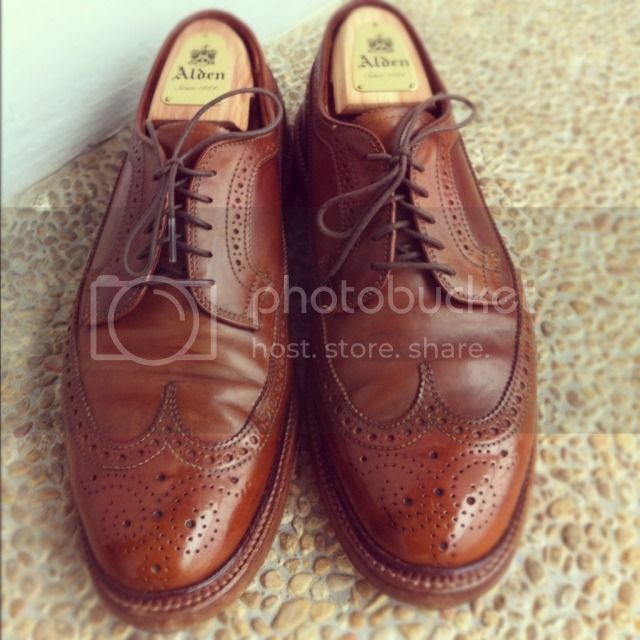 I think alden should man up and offer refurb service price instead of wholesale price. Anyway what's the wholesale price? Lower than refurb service? amlai sorry to hear about your loss. Welcome back, please keep posting in this thread. Ok, following on from todayâ€™s visit to Richard Smith, hereâ€™s my proposed design for the MTO Alfred Sargent Kelso boot. If thereâ€™s enough interest, Iâ€™ll set up another order for the same boot but on a different spec and run them side-by-side. Hopefully the info below is comprehensive enough to pre-empt most questions and avoid shitting up the thread. If you're interested, drop me a line as soon as possible as I'm planning on placing the order as soon as I have five more confirmed participants and a spec agreed by all. 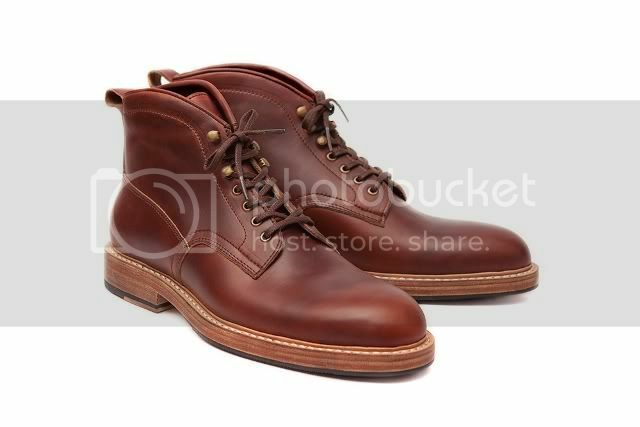 Pattern: Kelso pattern (see below) which is a mock cap veldtschoen derby boot with nine pairs of eyelets and a half-bellows tongue. 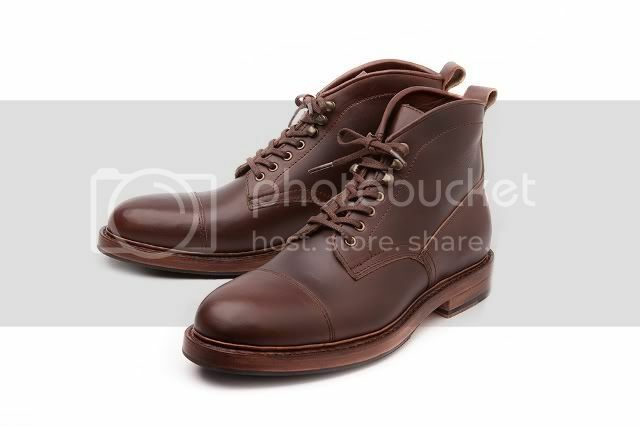 An option would be to have a plain toe to make the boot look a little more like the C&J Snowdon (below). If the pattern allows, I'd be after an integral leather pull tab like the Snowdon, too. Last: The 7WK last (see below). According to Alfred Sargent, the Kelso pattern can be used on three lasts: the standard 88 last, which is a fairly blobby last; the 77 last, used on the Dumfries boot and which has a high instep; and the 7WK which is robust yet slightly more streamlined than the other two. Sizing advice: Itâ€™s recommended that you size down half a size from your UK size for the 7WK last. Iâ€™m going TTS however, as I could use a little space around my little toes (as Iâ€™ve found out to my cost with the Skye bootâ€¦). Eyelets: Top five pairs with speed hooks, nothing fancy with the lower pairs â€“ like the Snowdon. 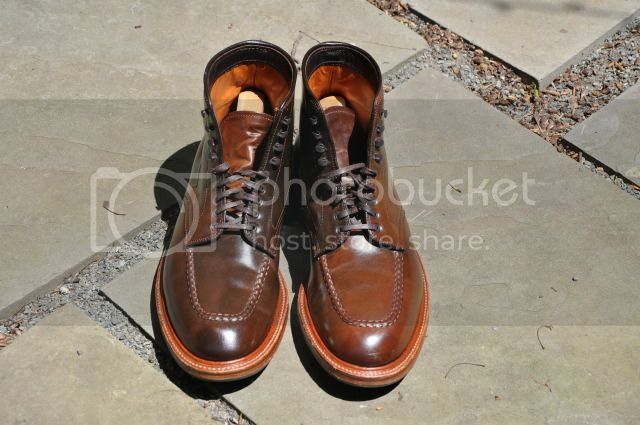 Sole: Dainite Ridgeway sole (below) in brown â€“ much better suited to poor weather than commando or studded Dainite. Lead time: At least ten weeks and possibly significantly more (although group MTOs take less time than single orders). According to Richard, Alfred Sargent currently have more orders than they have production capacity (very much like Crockett & Jones) and so it may well be more like 16 or so weeks. Cost: Work on a guide price of Â£550, minus 20% VAT for non-EU orders, and to be confirmed once Sargent have seen the exact spec. Once the price is set in stone, a non-refundable deposit of Â£100 is required. Richard is happy for people to make payments in instalments during the wait time, which would be handled by him personally. Break in has been butter with the CXL leather. The arch took some getting used to, but other than that, very comfortable and very well made boots. Those are White's? They look a little sleeker to me than normal, but it could be the angle (or it could just be me). The pants are great, too. so three friends of mine did MTO at Sagara Indonesia. using Horsebutt Chromexcel Black, Dark Brown, & Tan. My experiences with CXL are that it is very supple and comfortable from the start. It is also not a particularly thick leather, so break in time is minimal. On the other hand, the Distressed Smooth leather was quite thick and rigid. My ankles were aching the first week; it didn't help that one of the speedhooks protruded quite a bit, digging into my ankles. Solved that problem with a hammer and a punch. And while the Obenauf's experiment didn't produce desirable cosmetic results, it worked wonders for the comfort of the boots. That and they repel water quite nicely now. I have adjusted to the arch and indeed they are very comfortable. I still can't believe I didn't get my feet into a pair of White's sooner. Beauty of the semidress last: they can look really slick in a Semidress with a close trim and leather sole, or rather rugged in a Bounty Hunter with a Vibram sole. For me, they fill the void of a robust work boot when Alden shell boots are too dressy, while still looking pretty classy. Were your friends happy with the quality? How was the fit? These are going up in the supermarket. I did care for them pretty well (in terms of maintenance), but I also really wore them a lot. I wore them in every kind of weather. I think after I got them thoroughly soaked in some rain, the leather in that one spot got really brittle. I think I got very good use of of them and I really don't feel like they fell apart faster than they should. 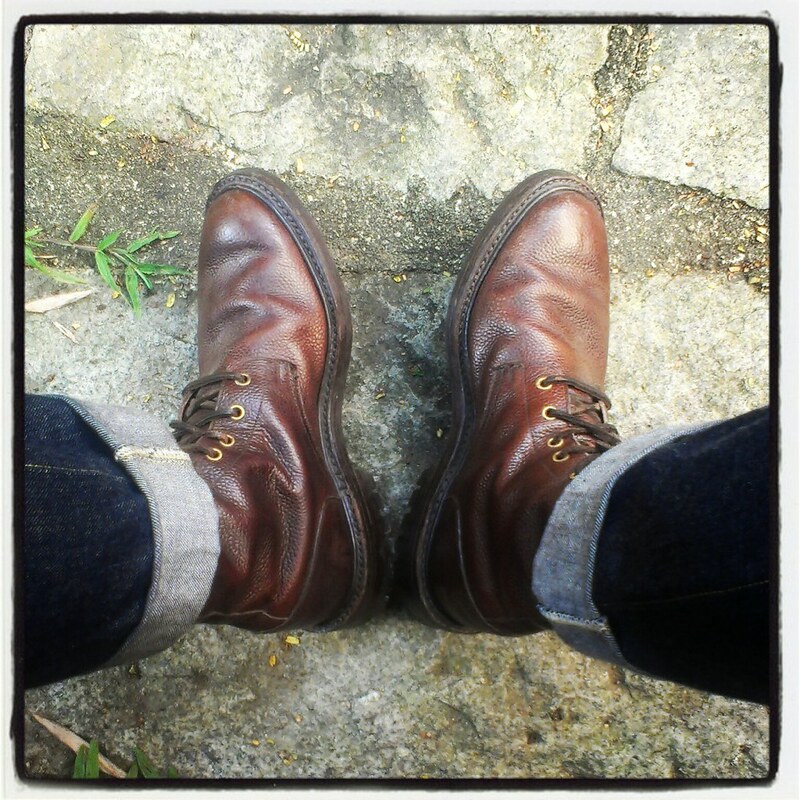 My other Aldens of about the same age are still holding strong, though I haven't been wearing them quite as much. Thanks. I know it's been a while. dude, I still cant rep with this fucked up forum update, but that family pic is nice. what color is the middle Indy boot? more old boots...and in larger sizes than usual. these certainly exceeded expectations after a good few hours spent cleaning them up then feeding the leather. 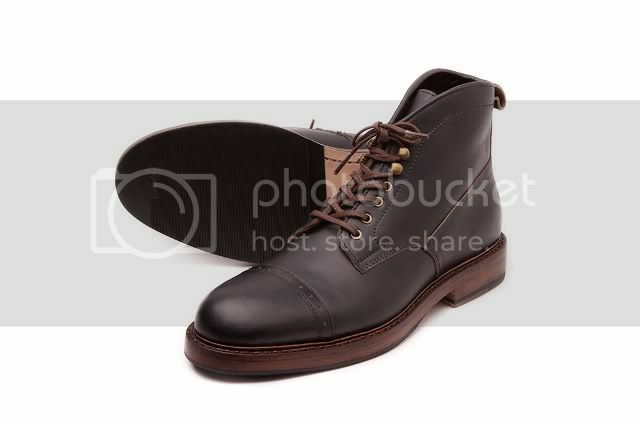 seriously, is there any point in buying new boots when you can find stuff like these pairs? beva leather was tanned by william paul ltd on the kirkstall road in leeds, oddly enough very close to an old rugby club where i used to train. photo from leodis.net, linked above. the boots are identical in style to this pair in the london college of fashion's archives. their beva leather is described as being 'chrome leather'. just to throw in another image for more english footwear. these originally belonged to slab whom then sold them to someone, who then sold these to me. they are my go to boots. great couple of posts. what's the 94% on the ridgeway?